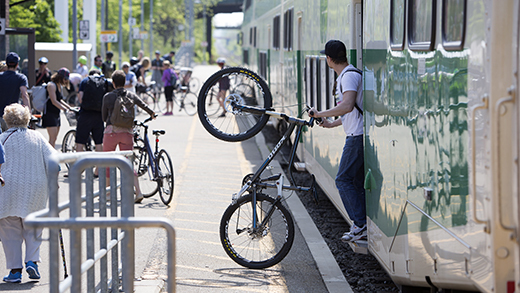 Reserved bicycle parking lets you rent a space for your bike in the bicycle area at GO stations for a 1-year period. See if your station offers reserved bicycle parking, and then you can apply online. You’ll get a space if one is available. A reserved bicycle parking space costs $50 per year, including HST. You may rent a space for a minimum of 1 year. You’ll automatically be billed each year until you give us 30-days written notice (by mail or email) that you no longer want reserved bicycle parking. You can pay for your reserved bike space either by pre-authorized debit or pre-authorized credit (Visa, MasterCard, and American Express). To pay by credit card, you must have a valid email address. We reserve the right to charge a $35 fee for any dishonoured payments. Once you have reserved bicycle parking, you need to know which guidelines to follow and how to transfer to another bicycle parking area. You may park a regular or an electric-assist bicycle. You cannot park any motor-assisted bicycle which uses liquid fuel (for example, including but not limited to gasoline or diesel). You can leave your bicycle overnight, for up to 72 continuous hours. We reserve the right to remove bicycles that have been parked over 72 hours or seem abandoned. However, before we remove a bicycle, we will try to contact the bicycle’s rightful owner and ask that it’s collected. You may not lend or sublet your reserved bicycle parking space. Only bicycles identified on the application are permitted to use your space. Please keep track of your key FOB for your reserved bicycle parking and don’t lend it to anyone. Keep in mind that station attendants don’t have access to the bicycle cage in order to keep it secure, and they can’t help if you don’t have your key FOB. Report a lost or stolen key FOB, and request a new one by calling 416-869-3600 ext. 7276 or sending an email so we can deactivate the missing FOB. A replacement FOB costs $25. If you lose your key FOB while your bicycle is locked within the cage, call Transit Safety at 905-803-0642 or 1-877-297-0642 to get access to the cage. Leave your bicycle inside the reserved area, out of the way of other bicycles and lock the wheel to the frame to stop theft. If there’s no room in the reserved area, use the sheltered general purpose bicycle racks at that station. If there isn’t an attendant, call Transit Safety after 9 a.m. at 905-803-0642 and let them know your name and the station. It’s a free to call from a GO-station pay phone. We’ve ensured that the reserved bicycle-parking areas are as secure as possible. However, if your bicycle is stolen or vandalized while in the bicycle cage, please report the incident to GO Transit Safety after 9 a.m. at 905-803-0642. Please know we aren’t responsible for damaged or stolen bicycles. Send us an email to transfer to another station’s bicycle-parking area. You get one free transfer per year when using reserved bicycle parking. But if there isn’t space at the station you want to transfer to, you won’t get a refund. If you decide to cancel your reserved bicycle parking within the year, please know you won’t get a refund for the time remaining.